Home / International / News / Politics / Why investigate Duterte on Sr. Fox arrest when CHR didn’t investigate Aquino before? Why investigate Duterte on Sr. Fox arrest when CHR didn’t investigate Aquino before? In 2013, Sister Patricia Fox, a 71 year old Australian missionary nun was arrested due to Hacienda Luisita protest. She and other communist who protested were arrested and charged with illegal assembly, direct assault, trespassing and malicious mischief under the administration of former President Benigno “Noynoy” Simeon Aquino. Now it seems like the communist groups are using the churches and human rights groups as their fronts in their aimless fight against the government. These communists kill police and soldiers use two of the most respected organizations as human shields against the government. Recently, Fox participated in another rally in which she was arrested. This instance is now under the administration of President Rodrigo Roa Duterte and he is well aware that Fox is a communist and yet he still took measures through the law and he did not exhibit any hatred-triggered impulsive force. Fox violated the law that prohibits foreigners and tourists from participating in any political movements in the Philippines so she was arrested by the Bureau of Immigration (BI) and is awaiting trial. But despite the civilty of the administration of Duterte, the Commission on Human Rights still wants to investigate the arrest of the 71 year old nun. In a video posted online, it can be seen that the nun was in the protest holding a plaque card. But when she was questioned by officials of the BI, she denied participation in the protest. She basically lied. Before Fox’s arrest, another foreign communist was deported, Giacomo Filibeck an official of the Party of European Socialists. He came to cebu to attend an Anakbayan Partylist Congress all while coming to the PH as a tourist! Now this is illegal act in the PH, even associating with political groups in the Philippines is illegal, why? This is all due to the Operations Order no. SBM2015025 that tourists are prohibited from joining any political activities in the Philippines which was approved by former Department of Justice Secretary Leila De Lima. But it is clear, what Fox did was a violation of the law and still the CHR sided with the law-violating nun. Other than siding with Fox and the alignment of the CHR to communism, during the 2013 arrest of the same aforementioned nun, the CHR didn’t investigate Aquino despite posing more extreme charges than the recent arrest. Is the CHR really biased? 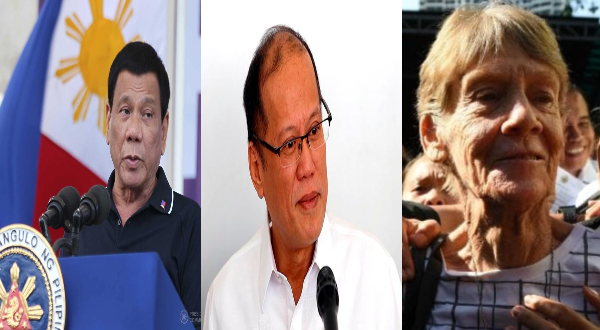 Has the CHR become the Yellow and Communist’s weapon against Duterte?